When you've got fabulous brows, heads will turn! Lucky for you, it's never been easier or more adorable to get your brows looking their best. All you need is a little know-how and a great eyebrow shaping - it's like an instant face-lift! 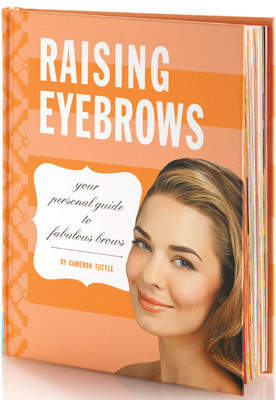 This guide has everything you need to raise your brows to their beautiful best - and raise the eyebrows around you. Get tones of tips and tricks from the eyebrow experts at Benefit Cosmetics. Brow Facts the will Raise the Eyebrows! In July 2011 Benefit's brow-arch service became the number one top selling product nationally in the prestige makeup category at Myer. that's over 400 a day! that's nearly 20,000 a year! Benefit has performed over 250,000 brow services since it started in 2008 at the Benefit Boutique Paddington. Benefit opened its first Browbar door in Myer Sydney City in 2008. Benefit performs a brow arch every minute of everyday somewhere around the world. Benefit has over 1,000 licensed Aestheticians and Cosmetologist on staff and assisting customers around the world! All Benefit brow products combined sell 1 unit every minute of everyday around the world. Cameron Tuttle is the author of the Paisley Hanover novels for teens, the best-selling Bad Girl's guides, and The Paranoid's Pocket Guide. She lives, writes and raises eyebrows in San Francisco.